Saturday 24th August 2019 at 2:00 pm. Category AS. 5 miles / 1499 ft. Minimum age 16 years on race day. Entries £3.50 on the day. Registration is at Pendleton Village Hall, Main Street, Pendleton, Clitheroe BB7 1PT. The race takes place thanks to the goodwill of local farmers and the villagers of Pendleton. Please park responsibly and pay due respect to others using the village. Held under UKA rules and registered with the FRA. Kit Requirement: A decision will be made on race day. Runners are asked to bring full waterproof body cover (ie covering the torso from head to ankles) as this may be required. Records: Men – K. Capper 30.38 (1983). Ladies – C. Greenwood 36.36 (1984). 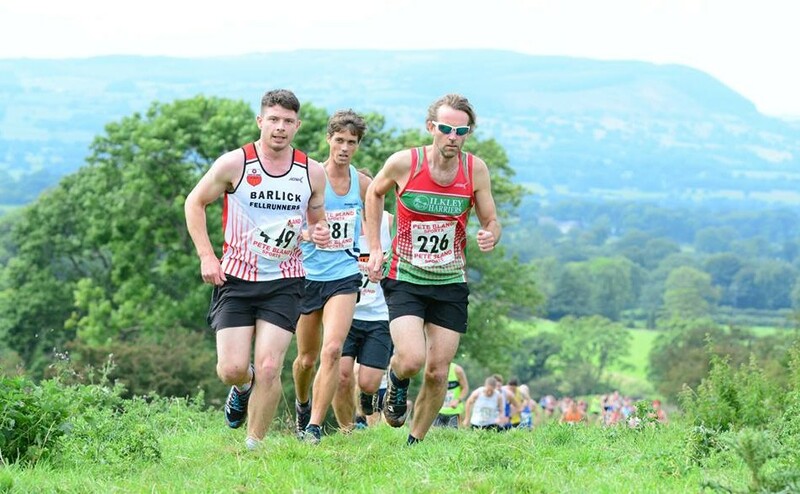 Results for this year’s race will be published on this page. Results from previous years. Bottle of Moorhouse’s beer for all finishers aged 18 or older. Start: In field behind the Village Hall. The course is partially marked. Download GPX file. 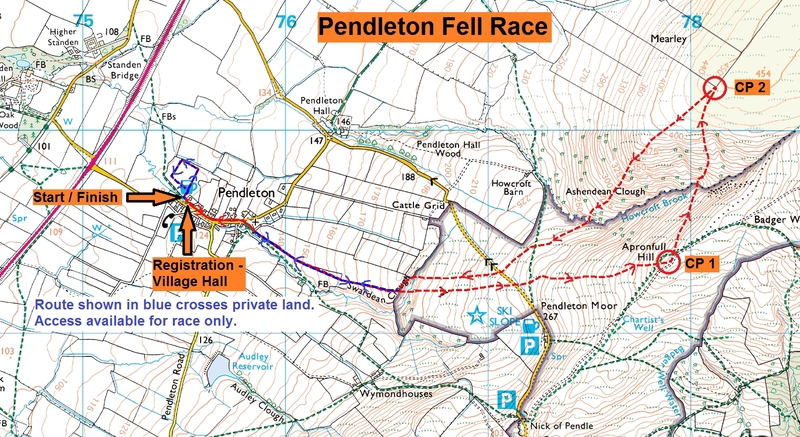 Route Description: The race starts with a loop of the field behind the village hall, then up the main street. The route then climbs gently through two fields. After a scramble out of Swardean Clough the climb continues through the tussocks before crossing the road and onto the moor proper. Climb to Apronful Hill before some respite on the descent to Ashendean Clough – across Howcroft Brook and up the steep climb through the ferns to the wall corner. Turn at the “memorial“ cairn and enjoy the long descent, gentle at first but then steeply down to cross Howcroft brook again. More tussocks before and after the road crossing before reversing the outward route down through the fields and village to finish at the village hall.